According to JancisRobinson.com, Clairette is a “widely distributed southern French variety producing full-bodied whites that can hang on to their acidity quite impressively” and is “also widely planted in South Africa, where it is generally used for blending”. In fact, Clairette is not that widely planted locally – 263ha at the end of 2013, putting it ahead of Tinta Barocca but behind Villard Blanc and based on what little experience I have of it, it’s generally quite lean if indeed acidic. 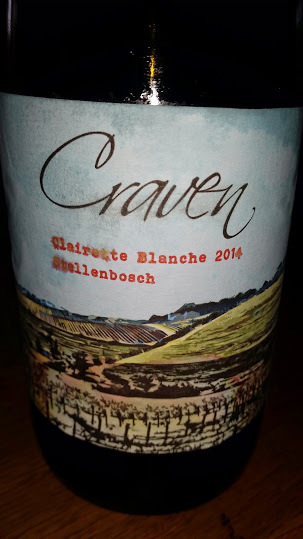 Mick and Jeanine Craven have, however, have come up with something quite smart in the case of their Clairret Blanche 2014. Grapes come from a Stellenbosch block estimated to be between 35 and 40 years old, 50% whole bunch pressed and 50% left on the skins for two weeks. There’s a slight waxy quality to the otherwise shy nose but the palate shows surprising depth and texture given an abv of only 11%. This is not a primary fruit bomb but look hard enough and you’ll find notes of lime and green apple. “Saline” is becoming an over-used term but this wine definitely has that character, too. Wine Cellar price is R125 and you’re getting a lot of wine for your money. Does it still appear cloudy, Christian? They promised that it would, as a finished product. I suppose it does a little but I increasingly tend not to be too worried about cloudiness on these sort of wines one way or the other! Sure, but I still enjoy the little visual pleasure, a bit like watching a Guinness settle in my glass. Maybe my heart will change on this issue once I’ve had a few cloudy stinkers, but I’ve enjoyed basically all the cloudy SA white wines that I’ve tried so far. I must admit I am with Kwispedoor on this one. Until I have a few cloudy stinkers I am going to keep on purchasing same and support these wines. We want more Craig Hawkins, Craven, Bosman Orange Wine and whoever also has guts. Thank you! With regards to ‘cloudiness’, I am sure none of us who make said wines intend to set out to make a cloudy wine. Sometimes wines settle naturally, sometime they don’t. It ‘s just then a matter of filtering or fining if you want to clean it up. In our humble opinion colour and clarity are tasteless so there is not point worrying too much about them. But hey…. each to their own. What is the general advice on this wine’s drinking window ?